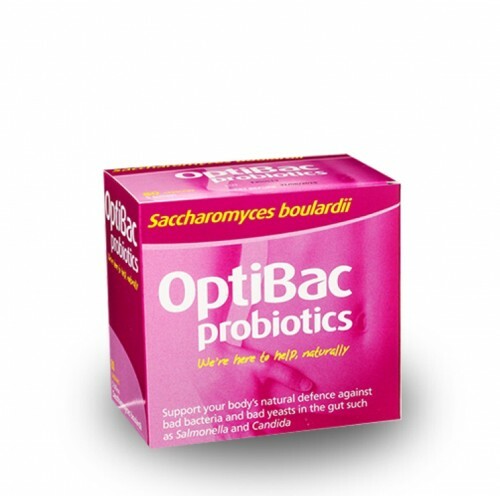 A pure Saccharomyces boulardii supplement. An extensively researched microorganism, proven to reach the gut alive. A capsule provides 5 billion live cultures of pure, shelf stable Saccharomyces boulardii. This strain has been internationally acclaimed as a well-researched and unique microorganism, and has been safely used for the last 50 years. Saccharomyces boulardii is a natural food supplement, and not a medicine. Saccharomyces boulardii contains 5 billion live microorganisms of pure Saccharomyces boulardiiprobiotic guaranteed per capsule. McFarland, L.V. & Bernasconi, P. (1993) Saccharomyces boulardii: A Review of an Innovative Biotherapeutic Agent. Microbial Ecology in Health and Disease; Vol. 6 pp. 157-171. Hochter, W. et al (1990) Saccharomyces boulardii in acute adult diarrhea. Efficacy and tolerance of treatment. Munchener Medizinische Wochenschrift; Vol. 132 (12) pp. 188-192. Cetina-Sauri, G. & Basto, S. (1994) Therapeutic evaluation of Saccharomyces boulardii in children with acute diarrhea. Annales de Pediatrie; Vol. 41 (6) pp. 397-400. Kurugol, Z. & Koturoglu, G. (2005) Effects of Saccharomyces boulardii in children with acute diarrhea. Acta Paediatrica; Vol. 94 pp. 44-47. Maupas, J.L. et al. (1983) Treatment of Irritable Bowel Syndrome (IBS) Double Blind Trial of Saccharomyces boulardii. Medecine Chirurgie Digestives. Vol. 12 (1) pp. 77 – 79. Jawhara, S. & Poulain, D. (2007) Saccharomyces boulardii decreases inflammation and intestinal colonisation by Candida albicans in a mouse model of chemically-induced colitis. Medical Mycology, Vol. 45. Issue 8. pp 691 - 700. Berg, R. et al. (1993) Inhibition of Candida albicans translocation from the gastrointestinal tract of mice by oral administration of Saccharomcyes boulardii. J Infect Dis. 1993,Nov;168(5):1314-8. Murzyn, et al. (2010) Capric Acid Secreted by S. boulardii Inhibits C. Albicans. August 2010, Plos One, Vol. 5. Issue 8. Castagliuolo, I. et al. (1999) Saccharomyces boulardii protease inhibits the effects of Clostridium difficiletoxins A and B in human colonic mucosa. Infect Immun. 67(I): 302 - 307. Pothoulakis, C. et al. (1993) Saccharomyces boulardii inhibits Clostridium difficile toxin: A binding and enterotoxicity in rat ileum. Gastroenterology: 104(4): 1108 - 1115. Guslandi, M. et al. (2000) Saccharomyces boulardii in Maintenance Treatment of Crohn's Disease. Digestive Diseases & Sciences. Vol 45, 7, 1462 - 1464. Guslandi, M. et al. (2003) A pilot trial of Saccharomyces boulardii in ulcerative colitis. European Journal of Gastroenterology & Hepatology. Vol. 15 pp. 697 – 698. Gradually build up to 3 caps twice a day (daily dose: 6 Caps) Initially, we recommend taking 1 capsule twice a day in the first week, 2 caps twice a day in the second week and 3 Caps twice a day in the thrid week. This gradual build up in dosage is to avoid severe "die off". Take alongside 1-2 Caps of Extra Strength Probiotics. 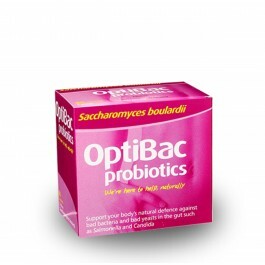 Storage: Keep in a cool dry place, out of sunlight.This probiotic does not require refrigeration. Saccharomyces boulardii is a unique yeast and microorganism. 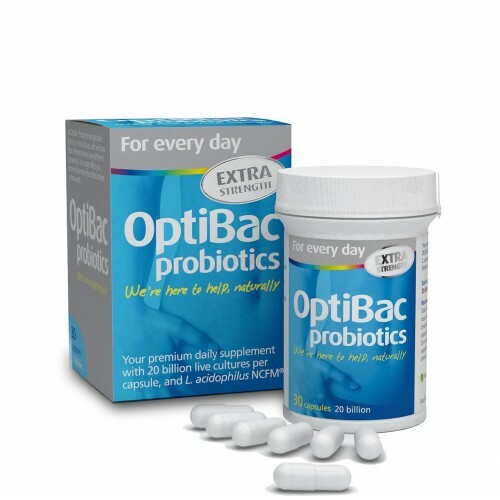 This strain from OptiBac Probiotics is scientifically proven to reach the gut alive.